People may come and go, but friends that matter most form lasting friendships and the "bestest" of friends. Check out the latest and most sentimental TV spot promo for Pixar's The Good Dinosaur. This is extremely charming and touching. A sweet reminder of how important friendship truly is. The clip takes us back in time through "20 years of friendship," then it ties it back to the main story at hand. "A single friendship can change everything. 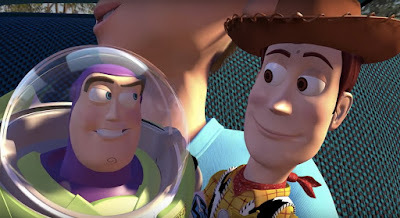 From Toy Story to The Good Dinosaur, join us in celebrating 20 years of friendship from Pixar Animation Studios." The Good Dinosaur is also about friendship - Arlo, the apatosaurus, and his human pet that he names Spot. I am really looking forward to this movie. I think it will rival with Inside Out as well. Take a look and enjoy! The Good Dinosaur is directed by Peter Sohn who also directed Partly Cloudy, animator on The Incredibles and WALL-E (which is my personal favorite). Dinosaurs are the dominant species on Earth (since the asteroid missed and they lived on for millions of years). One day one of the dinos, named Arlo (voiced by Raymond Ochoa) discovers a human toddler that isn't afraid of these creatures, and they adopt him as their pet. A.J. Buckley and Anna Paquin voice the T-Rex's Nash and Ramsey, while Jeffrey Wright and Frances McDormand voice Arlo's Poppa and Momma. Disney will release Pixar's This charming movie hits theaters everywhere on November 25th.